I know, I know, wings are probably not the healthiest part of the chicken but these are so finger licking good you won’t be able to resist. Plus it’s summer time and they make a great appetizer to whatever you’re grilling on the BBQ. The wings are super easy to prepare as you get them started in the oven under the broiler and when you are ready to serve them just finish them off on the BBQ to get a bit of charring and the required grill marks before you toss them with the spicy sweet sauce. The whole process will take you under 30 minutes. My only piece of advice with regards to these wings is that you should make more than you need, as it’s guaranteed that you and your guests will be begging for more! Rinse the chicken wings under cold water and pat dry. The wings you will get at the grocery store will mostly not be cut up. They are however easy to cut, just lay the whole wing flat on the cutting board, feel for the joint where the wing tip (smaller pointy section) connects to the rest of the wing. With the tip of the knife touching the cutting board, just cut straight through at the joint, which separates the wing tip from the wing. Discard the wing tip. Then locate the joint, which connects the wing and the small shaped drumstick, and by using the same technique simply cut through the joint to separate these two parts. Arrange wings in a single layer on the baking sheet and place under the broiler for about 6 to 8 minutes until one side turns brown then turn all the wings over and broil for another 6 to 8 minutes until brown and cooked through. In a small sauce pan melt butter over low heat then combine all of the remaining ingredients and heat through for about 5 minutes and keep warm on low until ready to serve the wings. Heat BBQ over medium high heat and brush the BBQ grate with oil. When BBQ reaches a temperature between 375oF and 400oF, grill the wings over direct heat, turning frequently for about 4 to 5 minutes until they are nicely charred with grill marks. 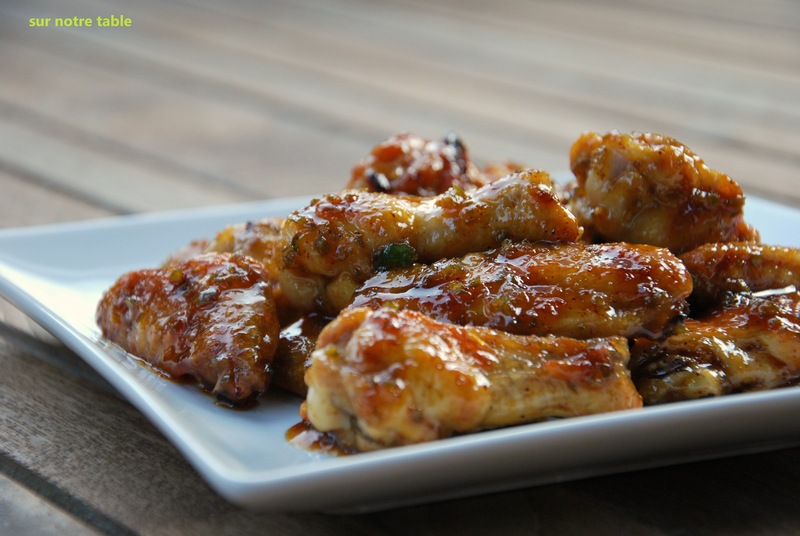 In a large bowl combine the chicken wings and the spicy sweet sticky sauce. Let this all rest for about 5 minutes in the bowl. This will give the sauce some time to caramelize and thicken over the wings. 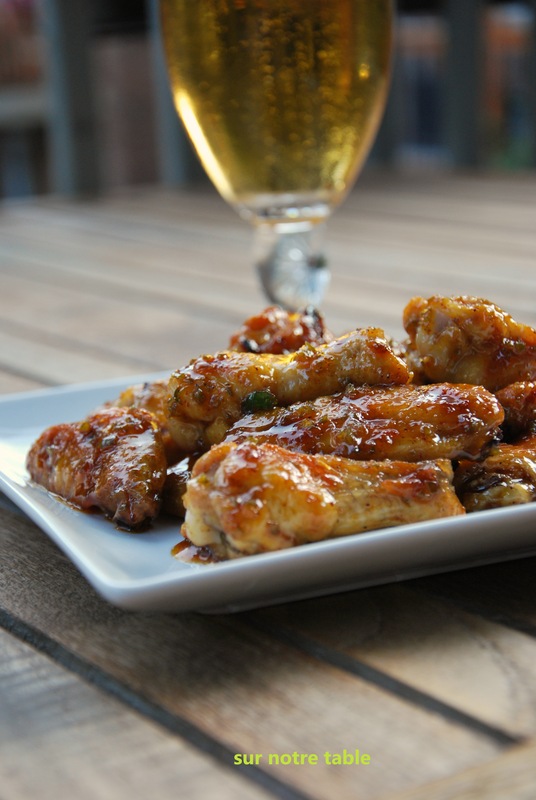 Then serve wings on a platter with a cold lager and make sure to get some extra napkins for your guests! 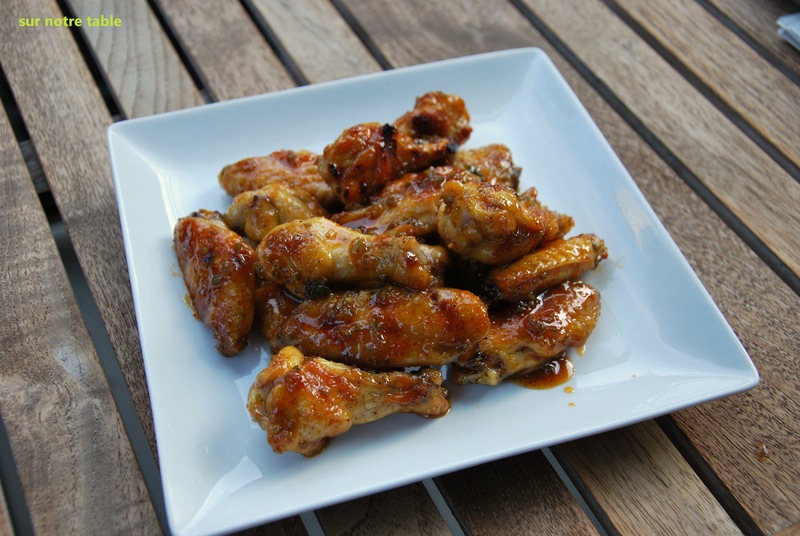 This entry was posted in Appetizer, BBQ, Chicken, Easy and tagged agave syrup, appetizer, BBQ, chicken wings, easy, fast, honey, jalapeño, sweet and spicy by Caroline Reny. Bookmark the permalink.